I've always tried to lead a health lifestyle. I'm not a smoker, I like to be active and work out, junk food is kept to a minimum and my worst vice is a tie between my love for cereal and a fun girls night out every now and then. During pregnancy and afterwards, especially while nursing, I am even more contentious about what I put in my body and staying as healthy and fit as possible because it's not just about me. That includes a better omega-3 supplement from iWi. I'm a religious vitamin taker and try my best to eat the nutrients my body needs but life is hectic and I'm human. Being pregnant my diet has definitely changed and my desires (nausea) have had an impact on what I'm actually consuming. To make up for my short comings I like to supplement as needed. I know omega-3 is essential to promoting healthy brain development and health during pregnancy and in early development. Plus, who doesn't want the added perks of healthy skin or lower risk for heart disease. I've learned about the iWi line of products and like not only what they are doing but, what they stand for. I have found that iWi Omega-3 is one of the more efficient and effective ways to get those health omega-3 fats into our body. 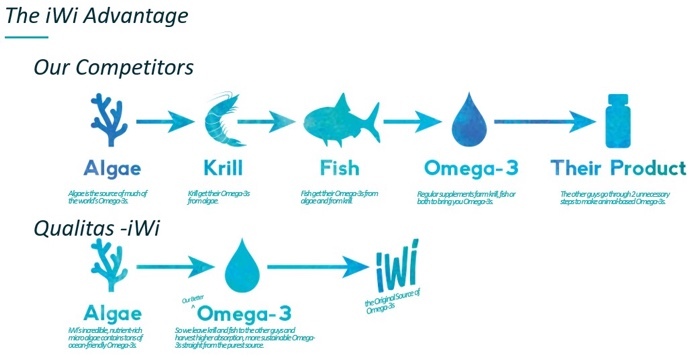 Sourced directly from algae DHA, iWi Omega-3 actually cuts out the middle man so to speak. It eliminates the fish that eat algae that were used to produce more archaic, less effective means of creating omega-3 supplements. This not only creates better absorption of the essential healthy fats into our body, it then leads to better results. Creating a healthier overall result. These iWi Omega-3 supplements are 100% vegan and are fully sustainable as the algae DHA is actually farmed using brackish water methods and solar power. It is made fully in the USA and is completely traceable so you can rest assured that what it says you're getting, you're actually getting. It's simply a smarter way all around. I stocked up on my iWi Omega-3 supplements as Sam's Club. They now carry iWi in more than 100 of their stores nation wide making it very convenient. Plus, Sam's Club has the best price value around and trust me, I've checked. Sam's Club carries these in their vitamin and supplements section of the stores making it easy to find. Are you a supplement taker? What's your go-to regimen? If you are or aren't, these are worth a try. This post is sponsored by iWi but the content and opinions expressed here are my own. Thank you for supporting the brands that help support this blog.